Romance tropes are standard themes or plot devices, usually in contemporary romances, that readers love. They are classic but updated, and highly recognizable. You know them well. Secret baby. Marriage of convenience. Dating the boss (who is a billionaire). Lovers reunited. Unrequited love. 1. Best friends are already close, sharing intimacies they took years to be comfortable with. 2. That closeness can lead to deep emotions, which is a cornerstone of a good romance. 3. Often one friend already loves the other, so there’s plenty of angsty aching. Even better if they both have feelings but neither one suspects. 4. If they didn’t see each other romantically, but something triggers them to look at each other differently, it’s exciting to watch it develop. 5. The dynamic fits into any kind of story, including romantic suspense. In my latest book, releasing today from Entangled Ignite, best friends Brady and Molly are spies falling in love as they search for truth about Brady’s brother’s death. I loved twisting up the typical friends-to-lovers storyline, adding action and urgency as their feelings for each other grew and changed. Read on for details about Hearts Under Siege, and the huge giveaway I’m doing with Sharron McClellan, who also has an Ignite, Risking It All for Her Boss, releasing today. For a limited time, both books are available at a special price of 99 cents each! Then tell me, what’s your favorite romance trope, and does it fit well into a romantic suspense novel? Looking forward to this. I adore friends to overs. Also best friend's sister/brother. Yes! I had a crush on my cousin's best friend's brother when I was a kid. Similar thing. :) So those stories are great fun, too! I had never heard of the romance trope before. I like the friend to lover that my husband and I had. I think we see this in the Castle series. Castle is a good example! I admit to not at first being a fan of friends to lovers, but it has grown on me a lot and I really enjoy these romances now! This sounds great. Love stories of friends to lovers! Congrats on this latest release! I enjoy the variety of tropes out there... some of my favs are Mistaken identity, Friends to Lovers, etc. You hooked me on this story. 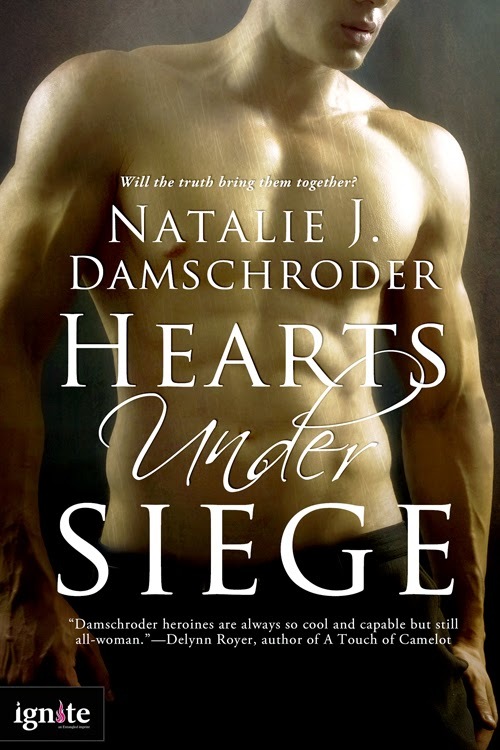 I just went to Amazon I downloaded Hearts Under Siege. AWESOME! Thank you, Joyce! I hope you like it! Hi, bn! Always good to see you! I like the friends to lovers stories. Downloaded both books today - can't wait to read them! Oooh, fantastic! Thank you SO much, Mary! I like the friends to lovers and also reunited lovers. Can't wait to read this one sounds really good. Thanks, Martha! Really appreciate it! congrats to Natalie on the newest release!!! I also really love the friends to lovers trope and this has definitely caught my attention :) Thanks for sharing! My favorite tends to be lovers reunited. I think that theme works really well in romantic suspense! There are so many opportunities there for the characters to come back into each others' lives and fall in love again. Congratulations on your release! It sounds great. Oh great, I was able to sign up for your newsletter on the Rafflecopter! Ooh, nice depth in this comment, Janice. :) I totally agree. Whichever comes first, your spouse really does need to be your friend.